While it has many names – the Good Will Fountain, the Friendship Fountain, the Whitney Fountain, the Three Graces, etc. 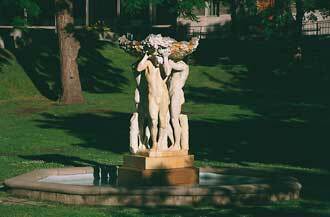 – McGill’s most famous piece of public art is most widely known as the Three Bares. While it has many names – the Good Will Fountain, the Friendship Fountain, the Whitney Fountain, the Three Graces, etc. – McGill’s most famous piece of public art is most widely known as the Three Bares. Nestled in a tree-lined dell in the shadows of the Redpath Museum, the marble fountain was donated to the University 79 years ago as “A Friendship Gift to McGill University by An Admirer of Canada.” The sculptor and donor was Gertrude Vanderbilt Whitney, a distinguished artist and great-granddaughter of Commodore Cornelius Vanderbilt, founder of one of America’s great fortunes. 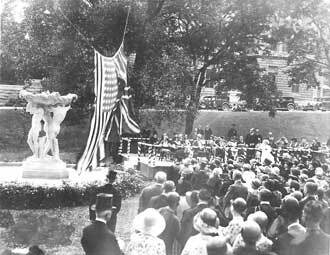 Swathed in a giant Union Jack and the Stars and Stripes, the statue of three naked men shouldering an earthen bowl adorned with leaves and ivy was unveiled during Spring Convocation on May 31, 1931, to gasps, laughter and a smattering of applause. Then there was the problem of getting the actual water to flow. With the economy in the stranglehold of the Great Depression, funds had dried up and it took more than two years after the fountain’s unveiling to install the pipes and turn on the waterworks. Not long after, bronze stains began to appear thanks to cast iron piping. Less pure-thinking girls and boys seemed to take great pleasure in targeting the statue for any number of pranks, dressing the figures in winter coats on cold days and adorning them with painted on underwear. During the 1955 fall term a number of students lobbied the Student Council to have a similar sized statue of three naked female figures placed in the open grassy area opposite the Three Bares, in front of the Macdonald Engineering Building. Urban Planning students felt it would certainly give the campus a 20th Century symmetry. Despite those rough early days – or perhaps because of them – the Three Bares fountain has become an iconic landmark of the downtown campus and has served as the backdrop to everything from concerts and student protests to barbeques and countless Convocation photographs. What would the downtown campus be without the fountain? Barely adequate. McGill Memories is a regular feature based upon Mackay L. Smith’s 2009 book, Memories and Profiles of McGill University. The book is available at the McGill bookstore.